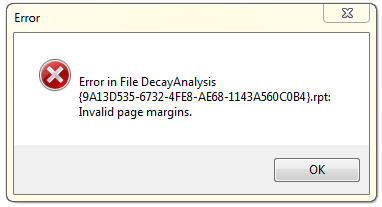 Error in File [REPORT-NAME]: Invalid page margins. To stop this error message, adjust the margins in your printers properties. In Windows, locate your Printers devices, right-click on the printer you’re trying to use and select Properties. Find the settings for the margins and restore them to their original settings and save the changes. Error in Prostat Autoanalysis – CrystalDecisions.Windows.Forms Not all 5lbs Conductive Rubber Electrode are created equal!